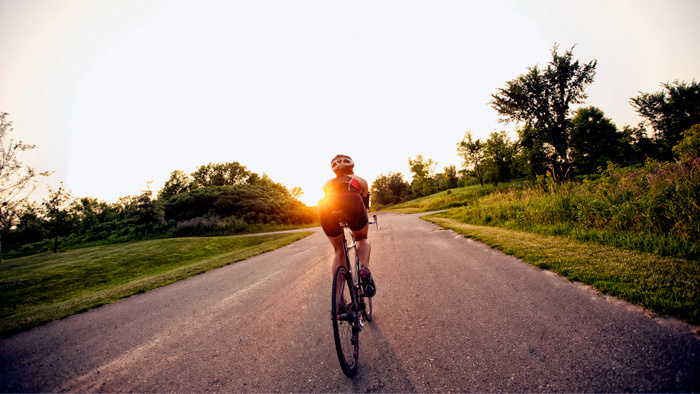 Exercise metabolism consists of the pathways and energy systems utilized by cyclists to convert the food we eat into energy that can be used during exercise. Our current knowledge of how food is converted to energy provides us a basis for understanding the topics of how we should train, eat, and even strategize races. Admittedly, the subjects of biochemistry and cell biology aren’t things most people get terribly excited about, but in cycling, knowledge of exercise metabolism is very relevant. How relevant? Relevant enough to be taught to every USA Cycling certified coach. Arguably, the most important molecule in exercise metabolism is adenosine triphosphate (ATP; triphosphate, as in three phosphates). ATP is the main energy currency of the cell. It is what allows us to do work, like pushing on the pedals of a bicycle. Energy from ATP is released when it loses a phosphate and becomes adenosine diphosphate (ADP; diphosphate, as in two phosphates). Once ATP is converted to ADP it has a hard time helping with the work in the cells (e.g. muscle fibers) until it is converted back into ATP. There are two main methods in which the cells of the body do this. A phosphate can be put onto an ADP through anaerobic means (without oxygen), through a series of processes collectively known as substrate phosphorylation, or through aerobic means (in the presence of oxygen) by a process called oxidative phosphorylation. The anaerobic means of ATP “replenishment” are the ATP-PC system, glycolysis, and adenylate kinase phosophorylation. The ATP-PC system is a fairly simple process. A creatine molecule holds onto a phosphate molecule until a needy ADP molecule comes along. The creatine phospate molecule gives up its phosphate molecule to an ADP and reverts to creatine in the process. Because this system is so simple it can generate ATP very quickly, but as you can probably guess, creatine phosphate stores are finite and they need to be recharged by the ATP produced through other systems when they have been depleted. In an all out effort, the ATP-PC system is the primary manner ATP is replenished for the about the first 10 seconds. It is important to note at this time that all of the energy systems discussed within this article are always occurring. They never shut off completely or provide one hundred percent of the ATP. They merely change in the percentage and amount of energy they contribute (Figure 1). Of all the anaerobic systems for ATP production, glycolysis (the breakdown of carbohydrates) is arguably the most important for endurance cyclists. During glycolysis glucose and glycogen (carbohydrates) are broken down, resulting in a conversion of ADP to ATP. For every glucose molecule broken down through this process you get a net gain of 2 ATPs (breakdown glycogen and the net gain is 3). The advantage of glycolysis is that it can produce a lot of ATP quickly, and more importantly, faster than the aerobic system. The disadvantage is there is only so much carbohydrate stored in the body at a time and our nervous system runs primarily on this fuel source. When carbohydrate stores get low and both the brain and the muscles want what is left you can probably guess which one is going to get shut down first. In an all out effort, glycolysis provides the lions share of your muscles ATP from the 10 to 30 second mark. 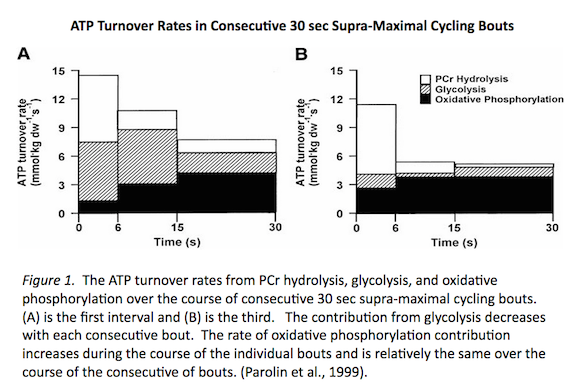 Glycolysis is also the main supplemental means of providing energy whenever we ride at an intensity that requires more ATP than our aerobic system can provide (this is partly why I argue it is the most important to cyclists). Interestingly enough, glycolysis shares an intimate relationship with the aerobic system. The end product of glycolysis is a molecule known as pyruvate. When enough oxygen is present this substrate is fed into the aerobic system where it is further stripped of its energy in order to produce more ATP. When oxygen concentrations are low, pyruvate is converted to lactate. Most cyclists have heard of lactate (or of its close chemical relative lactic acid). Lactate is not a waste product, but is actually an important part of anaerobic and aerobic metabolism. Unfortunately, there is a lot of misunderstanding around this molecule. For one, lactate does not cause muscle soreness. For another, fatigue from exercise is not due simply to lactate accumulation. The last anaerobic means of converting an ADP to an ATP is done with the help of an enzyme called adenylate kinase. The adenylate kinase reaction is fairly simple and can be expressed as such: adenosine diphosphate (ADP) + adenosine diphosphate (ADP) –> adenosine monophosphate (AMP) + adenosine triphosphate (ATP). Basically two ADPs combine to get one ATP and the byproduct of an AMP. The rate of this process significantly increases when you are in dire need of ATP and the rest of the anaerobic and aerobic systems are not delivering it. It’s kind of a last resort. The reason for this has to do partly with the conditions under which adenylate kinase activates, and partly with the reaction’s byproduct, AMP. AMP, having only one phosphate, needs two phosphates in order to become an ATP again. This is a very “costly” process, so to get around having to pay this phosphate “debt” AMP is converted into a molecule known as IMP that does not convert back into ATP readily. Even though IMP solves the “phosphate debt” issue, the cell is now left with the issue of disposing of the IMP it has accumulated. So, once again, while the mechanisms of anaerobic ATP production are great for providing energy quickly they all share the common disadvantage that their abilities to produce ATP are finite. Earlier I stated that it could be said that glycolysis is the most important anaerobic method of ATP production for cyclists, but by far, the most important energy system in endurance bike racing (criteriums, road races, time trials, mountain biking, and longer events at the track) is aerobic metabolism. Aerobic metabolism can provide copious amounts of ATP, only at a much slower rate than anaerobic mechanisms. In this system ADP is converted to ATP aerobically via an enzyme/molecular machine known as ATP synthase in conjunction with the electron transport chain and the Kreb’s cycle. This process requires the presence of oxygen in order to work. All the aerobic ATP production of the body’s cells occurs in the mitochondria. Mitochondria are small semi autonomous compartmentalized bodies of the cell. Aerobic metabolism has definite advantages over glycolysis. For one, a glucose molecule that is broken down aerobically (when 2 pyruvate byproducts from glycolysis enter the mitochondria) can yield 30+ ATP! (as opposed to 2 per glucose molecule with glycolysis)… and that’s after glycolysis uses it to produce its ATP! Another advantage of aerobic metabolism is that it is not limited to a carbohydrate fuel (e.g. glucose and glycogen) like glycolysis is. Aerobic metabolism can break down carbohydrates, fat, and protein in order to make ATP. Fats and protein are much more abundant fuel sources in the body than carbohydrates. The knowledge of this is one of the fundamental facts that influence pacing strategy and nutrition during endurance sport competition. The disadvantages of aerobic metabolism have been already hinted at. This great source of ATP only works when enough oxygen can be delivered to the working cells (e.g. muscle fibers). Also, due to its complexity, the aerobic system takes some time to “warm-up” before it can deliver ATP at its full potential (Figure 1). This causes what is called an oxygen deficit, which needs to be “paid back” later when we can recover. This is part of the reason why you breathe hard after intense exercise. It is important to understand that all of these mechanisms are occurring all of the time. What changes is the proportion and amount of ATP that each system provides (Figure 1). Exercise metabolism is very complex, even when it is has been presented in a simplified and generalized version, such as here. It’s not something that is completely learned by reading a single blog post, but hopefully this article helps you understand better what is going on in your muscles and body when you are riding and racing your bike. It should also be pointed out, that for this article, we have been looking at physiology through a microscope. Beware of an over reductionist approach to training and nutrition based on this knowledge alone. Physiology is a very complicated thing, so we must be careful how we apply our knowledge of what happens at a cellular level to the level of a biological organism (like an athlete). Likewise, buyer beware when a product claims to make cellular/molecular changes that should increase performance- even if the results are published in reputable journal! These results only make the claim plausible. Research with performance results (e.g. increases in power output or decreased 40 km TT times) should be presented to totally justify the claims of performance increasing products. Jason Boynton M.S. is an exercise physiologist, medical researcher, USA Cycling level 1 certified coach, and elite level cyclist. His educational background includes a Masters in Exercise Physiology from Eastern Michigan University and an honors degree in Cell Biology & Physiology from UW- Whitewater. During his masters degree he studied under Associate Professor and USA Cycling Faculty member Stephen McGregor. Applied science, critical thinking, and skepticism are the bases of his coaching methodology. As a researcher, he started working with trained endurance athletes in a lab setting in 2005. This has given him extensive experience and insight working with athletes above and beyond coaching. Jason recently accepted an international scholarship to an Exercise Physiology/Sports Science PhD program at Edith Cowan University in Perth, Australia. Find out more at www.boyntoncoaching.com.